« Spring is officially here ! Totally love the pants and glasses..the whole look is very cool! Such a great colors! I love your look and orange! Cat de scumpi sunt pantalonii aia similari, imi place modelul la nebunie, sper sa-mi gasesc sau sa-mi fac si eu pt primavara asta. Superba tinuta, in ton cu primavara; as fi renuntat la caciulita ce-i drept :P.
The print of your pants is amazing! Love your clutch! You look so sweet with that funny, orange hat! Amazing pants and clutch!! I want them in my closet!! These pants are FANTASTIC!!! You look great on them, and that clutch!Great sunglasses too Veronica!!! orange is a trendy colour! nice pics! LOVE the orange and those pants are spectacular! Very cool pattern and shape! awesome pictures..loove your pants!..so beautiful! I love this pants!! nice photos! such a cool outfit! i looove the colours! I totally adore this pants! The pattern, colours, shape – everything is gorgeous! 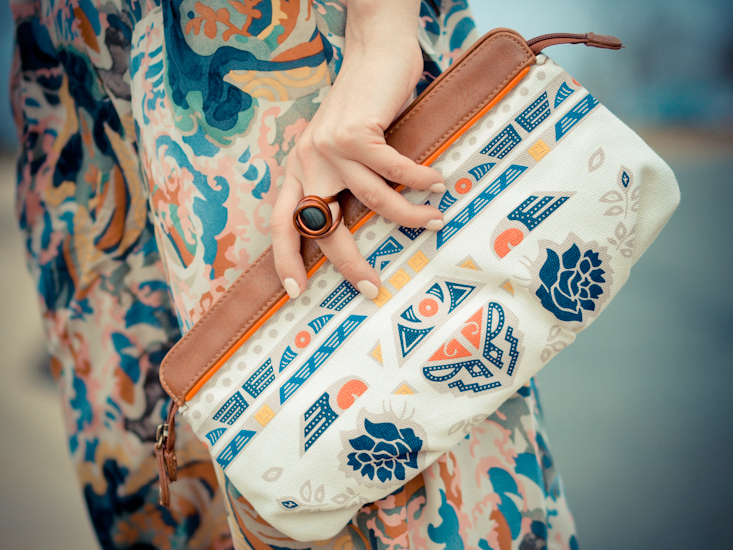 I like as well how you added another pattern via clutch! All in all – a great look! This is so so stunning! I love the print on prints and the colours are all so stunning! Great look! Those trousers are amazing!! but I am sorry, I just dont like the hat in this outfit. Gosh V, is there ANYTHING you can’t rock?? LOVING this entire springtastic look! That beanie is such a cool urban touch, so chic! Love it! And the little knot on the back of the top is perfection! you are “perfection”!!!!!! I love orange colour and this is just amazing!!!! everything in this outfit is amazing!! i can picture a huge chunky heel with those pants too for a modern 70s look! i would have never guessed to wear a beanie with it. great job styling! wow those pants are so absolutely fabulous and outstanding beautiful! really love them madly and even more the way you paired them with that orange shirt! really an amazing look darling! I absolutely love those pants!! i like your blog so much and i follow you.. follow me, if you want! Love orange and that outfit is incredible! Love everything specially the bag!!! Great look dear! want these pants like NOW!!! :-) amazing outfit!! Pass to me… I have a new post and new page!! Thank you so much!! Words like these coming from an artist like you, mean a lot to me!!! I checked out your other blog and think your work is fantastic!! omg! i love how you look!! There are so cute,and I love the shades !!! You look great in this outfit. The orange color is very pretty. Love your pants. beautiful printed pants! !love the color. Amazing pants, i love the print and the colours! The bag is amazing too. You look amaaaaazing!! Love the orange! OMG :D STUNNING!!!!! These pictures are amazing and this outfit is simply stunning!! These pants are so so beautiful!!!!! JEEZ! the colours are breath-taking! I adore the combinations! Those pants!!! WOW! you’re looking absolutely gorgeous with this outfit Vero! Love all the fun colors you wear! You look amazing!! Such a creative and great combo!! Quite a tangerine twist, that is needed this Spring. Perfectly paired clutch with pants and with orange. Beautiful, simply beautiful trousers & outfit styling! I am a fan of wide leg, silky trousers and with this print, you just need a simple tee to make the ensemble special. I just discovered your blog and I love it. Your sense of style is perfect.